I suspect Derrick Rose’s job still is safe, and I also suspect he’ll be back from his sprained toe/turf toe injury Friday in Cleveland. 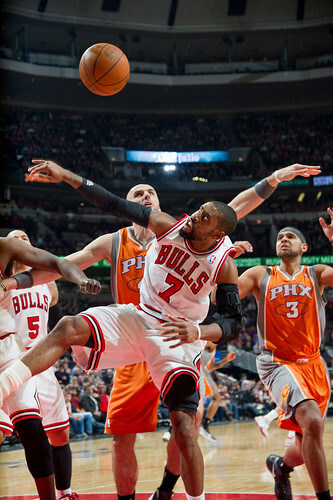 But Rose got a nice rest and coach Tom Thibodeau got a nice 54th birthday present Tuesday in the United Center with a near perfect — well, Thibs had some issues with the defense, of course — 118-97 victory over the Phoenix Suns. Even without Rose, who was missing his third game in the last five, the Bulls blew open this game early with big time performances from Carlos Boozer with a near Bulls career high of 31 points, C.J. 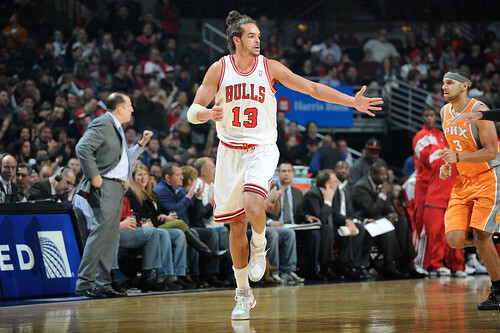 Watson with a sharpshooting 23 points, Joakim Noah with an animated 13 points and 12 rebounds and the return of Richard Hamilton from injury with 11 points and a team best six assists. The Bulls shot the ball magnificently, 72 percent in the first quarter, 66.7 percent at halftime in going ahead by 20 and 53.4 percent overall as they coasted all second half with leads of more than 20 points throughout. They accumulated a selfless 31 assists on 47 field goals, and had a meticulous six turnovers, none by Watson or his backup, John Lucas, in their 48 combined minutes. “We had a lot of guys play well,” said Thibodeau, who enjoyed a pregame chorus of Happy Birthday from rookie Jimmy Butler, one of the awkward hazing moments. 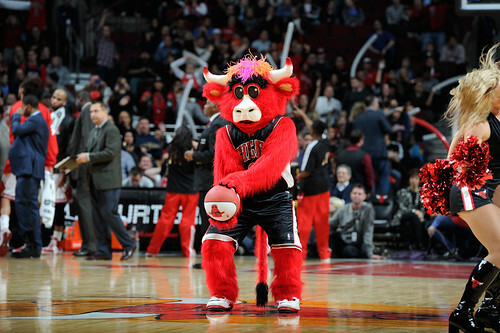 Though there was nothing awkward about the Bulls play after the raw egg they left in the loss in Memphis Monday. And that was the 13-3 Bulls with a season high 39 points in the first quarter behind 13 from Watson and 12 from Boozer and season high points for the half and the game as Boozer had 26 by halftime before the Bulls eased off. 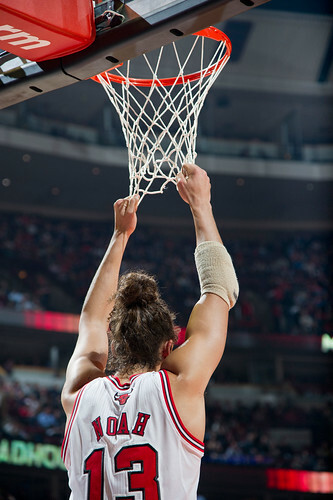 His Bulls high was 34 last season and career high is 41, and the way he was shooting both were in reach. Thibodeau did add he wasn’t happy with the defense as the Suns shot 51.4 percent, though that was mostly due to Steve Nash with 10 of 13 for 25 points with nine assists. Though perhaps more amazing he seems sanguine about staying with the 4-9 and sinking Suns. Nash makes about $11 million this season in the final year of his deal, and can you imagine if he were with a team like the Knicks or Heat, who lack a point guard. It’s difficult to believe the Suns will continue to hold onto him as their season tumbles out of control and they may have a chance to try to get something as they go into a rebuilding. 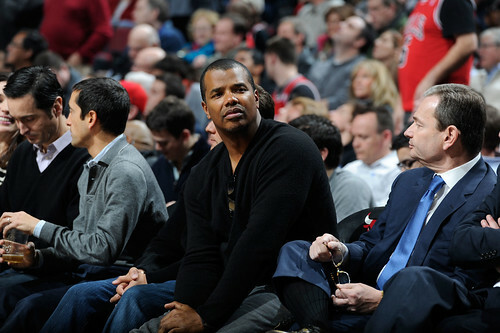 Similarly with Grant Hill, who is on a one year deal as well and at $6.5 million. Hill is coming back more slowly after some offseason surgery and had just eight points. An interesting footnote is he was believed to be close to signing with the Bulls before the Bulls signed Hamilton, Suns sources claimed. 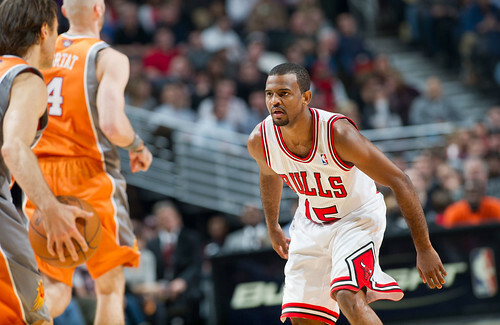 Hill was to go to small forward with the Bulls moving Luol Deng to shooting guard. 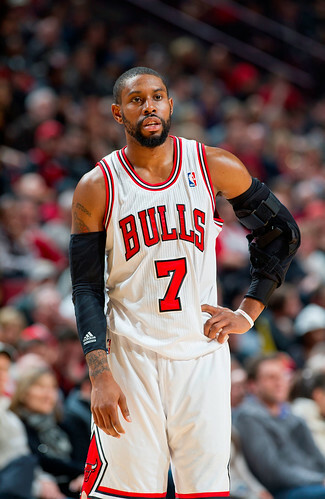 As much as I admire and respect Hill, I believe the Bulls made the better move with Hamilton, a true shooting guard who showed a good fit with the Bulls in his return from a groin issue. Thibodeau kept Hamilton limited to one playing sequence each half so Hamilton wouldn’t get cold and have to return to the game. Hamilton thanked the coach afterward and indicated he’s prepared to continue playing now. 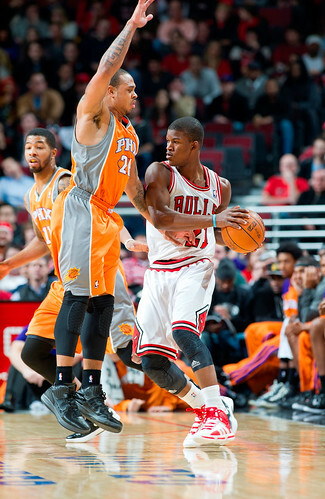 It certainly was for the overmatched Suns as Hamilton showed his passing ability as did Kyle Korver. Korver hasn’t been shooting well, but each had a team high six assists. Mostly it came from their same play when they come up over their screen and then hit the screener rolling inside, which usually was Boozer. Boozer used the occasion to pull up for short floaters and pick and pop jumpers with his arc virtually unerring in the first half. 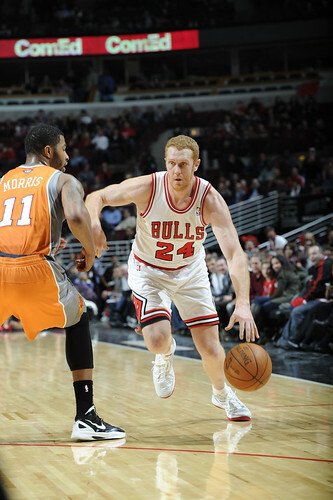 He was 12 of 15 and effectively broke open the game in the second quarter when he scored 16 of the Bulls 18 points. 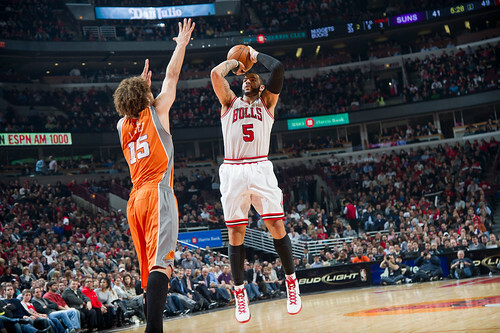 The Bulls went from leading 47-37 to 65-45 just before halftime. 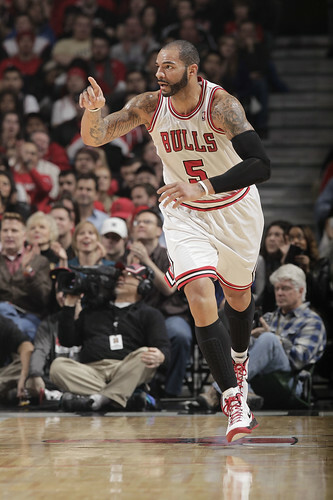 It was the best run of scoring Boozer has had since joining the Bulls last season. The Bulls don’t give much on injuries and predictably said they’d monitor Rose these next two days before playing in Cleveland Friday. Rose said walking into the arena his pain level was relatively high for now, though I suspect the way he approached treatment and the game he’ll want to be back for the Friday/Saturday back-to-back. The schedule breaks a bit next week with no back-to-backs before the two week road trip begin Jan. 29 in Miami for the national TV game and first meeting between the Heat and Bulls. 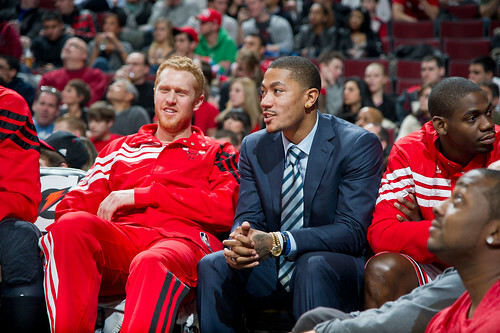 Rose will want to be ready for that first so called measuring stick of the season. So perhaps he skips the upcoming back-to-back, though I’d be surprised. 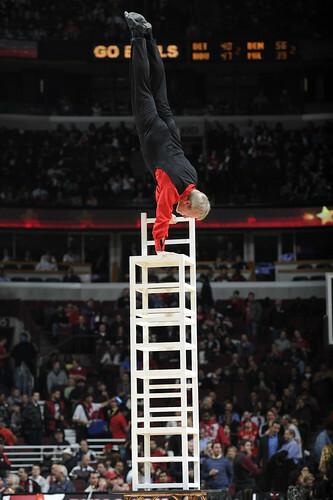 It really was a near perfect performance, though I do think the Bulls have been missing Rose’s defense. No, we never much talked about that before. But Rose has gotten better, and the Bulls had trouble containing both Mike Conley Monday and Nash Tuesday even though Tuesday’s win was relatively easy and Nash’s great game didn’t make much of a ripple to everyone but Thibodeau. Thibodeau loves that kind of stuff, though I mistakenly added a negative to his celebration when I asked at the postgame about Noah and Boozer playing so well together, combining for 44 points and 18 rebounds. 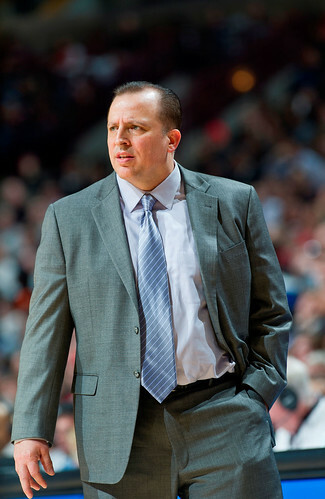 The tandem has been an issue some this season, which Thibodeau has rejected. So when I innocently — as I always try to do — raised it in the post game, Thibodeau shot back to my notion they haven’t exactly been Batman and Robin. Maybe not even Fred and Barney at times. Both did play very well Tuesday with Boozer driving early and hitting Noah for a 17 footer and the duo combining for every Bulls point in the last eight minutes of the second quarter when the Bulls broke open the game. “After he makes the first three or so,” Suns coach Alvin Gentry offered about Boozer’s first half, “you have to get out closer on him.” The Suns hired an assistant this season just for defense, but perhaps he wasn’t working Tuesday night. “We are not the Phoenix Suns of old,” said Gentry, offering up the observation that, yes, they are just the old Suns now. Noah then early in the third ran fullcourt with a steal for a layup and then followed that with a powerful putback dunk, the kind of shot he’s had trouble getting his hands to stay on this season, for a 71-47 lead just after halftime. Nash committed three turnovers in that first two minutes of the second half with Bulls pressure, and then Noah rebounded a Hamilton miss and was fouled, hitting one of two for a 25-point lead. The Bulls raised it to their game high 27 shortly thereafter on a Hamilton runner, and the 21-point final margin was the closest the Suns would be in the second half. I heard Noah screaming several times grabbing rebounds and dunking a miss, the sort of emotion we hadn’t seen much of this season. The Suns played mostly zone in that third quarter, and the Bulls mostly shot over it with Watson hitting a pair of threes and Luol Deng, who played a restful 27 minutes, and Hamilton one each. 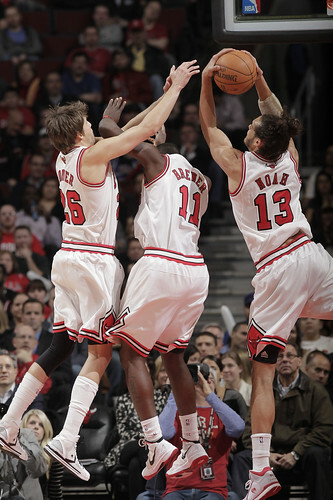 Overall the Bulls were five of 10 on threes. Thibodeau, as he did against Memphis Monday, tried Boozer in several rotations with Taj Gibson, a smaller lineup with theoretically more spacing, a pairing we hadn’t seen as much this season. And the Bulls also got a strong performance from Omer Asik with a rare double figure scoring game as he finished strong, rebounding one of his own misses for a follow slam dunk. 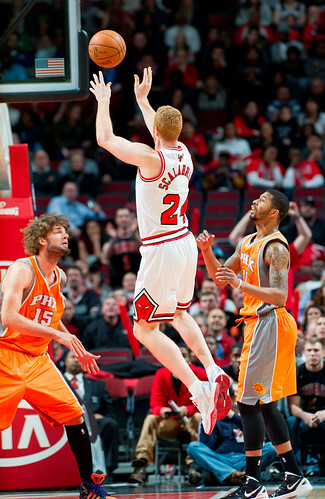 Toward the end of the game he absorbed a hard blow of frustration from Robin Lopez. And there was Omer with a look, though that might have been because Lopez looks like the guys in that insurance company cave man commercial. America, he is finding, can be a strange place.